Status and trends: In July 2015, the herd was 41,542 caribou (L. Parrett in Braem 2016). The 2015 estimate is a 39% decline since the peak size of 68,932 (10% SE) in 2008. The decline was first measured in 2011 and the rate accelerated between 2011 and 2013 (39,172 ±12% SE) compared to the rate of decline between 2008 and 2011. The decline appeared to stabilize between 2013 and 2015. The rate of decline 2008 to 2015 was an exponential rate of -0.073 which is a halving rate of 10 years. Ecology: The herd calves in the vicinity of Teshekpuk Lake. After calving and during the mosquito harassment season, the caribou move closer to the coast for insect relief (Parrett 2013). The herd has a high proportion of wetlands (23%) and tussock tundra (60%) on its annual ranges. While the herd typically winters on the tundra along the coastal plain, fall and winter range are annually variable and includes, in some years the Brooks Range. Even for the caribou that winter on the coast there are both migratory and non-migratory caribou: the non-migratory do not have directed movements (Parrett 2013). Fidelity to calving and summer ranges is relatively high although at the peak in herd size, the TCH has in summer overlapped with the adjacent Western Arctic and Central Arctic herds (Person et al. 2007). The calving, insect relief and summer ranges (Person et al. 2007) are within the boundaries of the National Petroleum Reserve- Alaska where areas have been leased for oil and gas exploration and development. However, concentrated calving and insect relief areas have been closed to leasing since 2013 (Parrett 2013). The eastern coastal ranges are within the footprint of the Alpine oil field and roads linked to the Prudhoe Bay field. People from Utqiaġvik (Barrow), Atqasuk, and Nuiqsut harvest the Teshekpuk herd with less use from Anaktuvuk Pass and Wainright. The number of people is almost 5000 (Braem 2017). Climate: The climate for the Teshepuk herd calving and summer range is influenced by the northern Alaskan coast as green-up is rapid, summer temperatures are moderated by the coast although precipitation is low which increases the drought index. Winters have higher snowfall and days with freezing rain than herds to the east. A warmer climate is driving significant trends (1989-2016) for decreasing snow depths 10 June, increased plant Growing Degree Days in June, an increasing mushroom index and warmer temperatures in October. Extreme events include the 2001-2002 winter with deeper snow and delayed pre-calving migration which together with a low number of plant Growing Degree Days in early June reduced calf survival (Carroll et al. al. 2005). Monitoring: Herd size is monitored during modified aerial photo-direct count technique every 2-3 years although it depends on weather conditions and if the caribou aggregate in large groups. Adult and calf survival and productivity are annually monitored as well as distribution and movements (Parrett 2013). The trend for parturition is a long-term decline since 2002: parturition rates were 61%, and 28%, in 2013 and 2014, respectively compared to long-term averages for parturition (72%, 2002–2012). Recruitment (% short-yearlings) has tended to decline since 2002 and averages 15%. Calf mortality is high in late winter-spring due to predation likely interacting with malnutrition and this is especially the case for calves that winter on the coast rather than the Brooks Range (Parrett 2014). Calves are relatively small with low body weight (5.5-5.8 kg 2012-2013) compared to neighboring herds and body weight has declined since 2006-2009 (Parrett 2013, 2014). Up until 2010, adult mortality annually varied (14.5 ± 1.00 SE) and did not show a consistent trend although annual rates were 28-32% higher between 2012 and 2014. Unlike most reporting for caribou herds, Kaplan Meier curves are calculated which suggests caribou survival declined steadily from about 1 year to 10 years of age and about 50% of caribou survive from 1 year to 6 years of age (Parrett 2013). Currently, harvests are estimated from previous records and community size as the hunter registration and reporting system was not effective (Parrett 2015, Braem 2017). For 2012 and 2013, the harvest was 3,387 TCH caribou which was approximately 6%-10% of the 2011 and 2013 estimated herd size (Parrett 2013). Management: The 2008-2016 decline was likely caused by summer and winter nutrition interacting with high levels of predation on calves in winter. Harvest will play an increasing role in herd dynamics if the decline continues and the age structure increases the susceptibility of the herd to further decline (Parrett 2014). Braem, N. M. 2017. Revised Options for Amounts Reasonably Necessary for Subsistence Uses of the Teshekpuk Caribou Herd. Alaska Department of Fish and Game Division of Subsistence, Special Publication No. BOG 2017-02, Fairbanks. Carroll, G.M., L.S. Parrett, J.C. George, and D.A. Yokel. 2005. Calving distribution of the Teshekpuk caribou herd, 1994-2003. Rangifer 16: 27-35. Parrett, L.S. 2013. Unit 26A, Teshekpuk caribou herd. Pages 246–284 [In] P. Harper, editor. Caribou management report of survey and inventory activities 1 July 2012–30 June 2014. Alaska Department of Fish and Game, Species Management Report ADF&G/DWC/SMR-2013-3, Juneau. Person, B.T., A.K. Prichard, G.M. Carroll, D.A. Yokel, R.S. Suydam, and J.C. George. 2007. 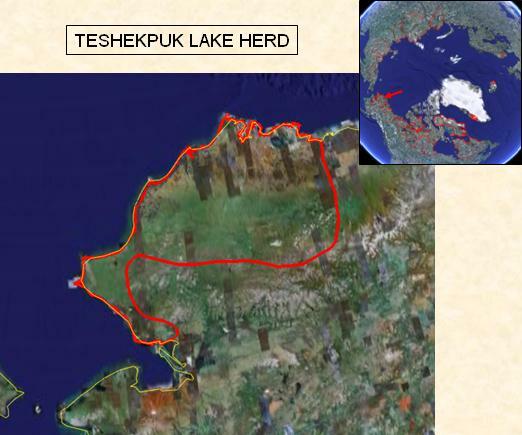 Distribution and movements of the Teshekpuk Herd 1990-2005: prior to oil and gas development. Arctic. 60: 238-250.